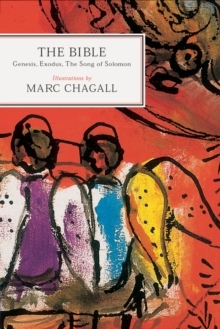 The celebrated artist Marc Chagall began illustrating the Bible in 1931, and it became his lifelong passion. This extraordinary volume includes more than 150 of his finest works, paired with three books from the Old Testament. When a portion of these Biblical illustrations were presented as an exhibition, the "New York Times" exclaimed that Chagall's art was "a lively and enriching way for anyone, no matter how deeply or how casually schooled in the Bible, to become reacquainted with scenes and stories from the Old Testament conveyed by an assured hand in an endearing style." Chagall's illustrations reflect his Jewish heritage and his view of the complex relationship between God and man, presaging many of the subjects and themes in his later work.